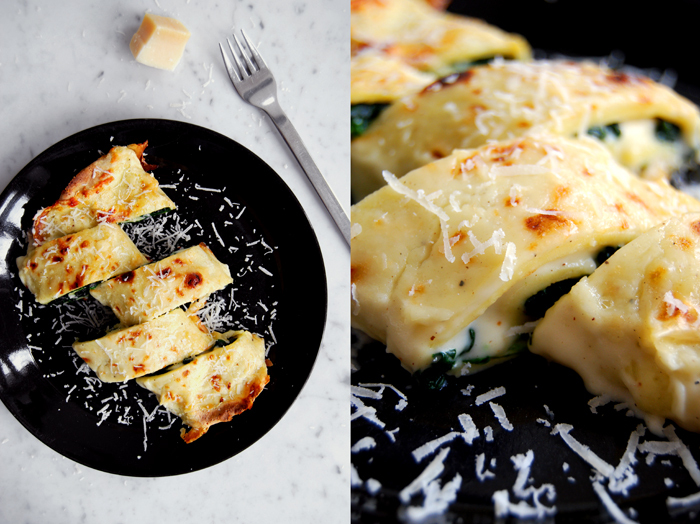 Spinach combined with a creamy sauce, be it Béchamel, ricotta or a blue cheese sauce is a delicious filling for any kind of pasta. 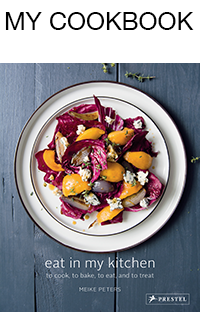 This combination doesn’t need a lot of additional spices besides salt, pepper and nutmeg. It’s one of those things that’s best kept simple. I love it in cannelloni or lasagna but I’m extremely fond of it in crespelle, thin Italian pancakes, wrapped around a tasty filling. You could also use a sauce Bolognese but that wouldn’t give the crespelle much space. Keep it pure and you can enjoy the eggy wrap complemented with a mild filling. When I’m in Italy I have this meal with tomato sauce poured on top, it looks like the Italian flag, green, white and red. The man of the house asked for the green and white version, just some parmesan grated on top of the rolled crespelle before they bake in the oven for 15 minutes. They turn golden, partially crisp but the spinach and Béchamel mixture keeps it moist and juicy inside. 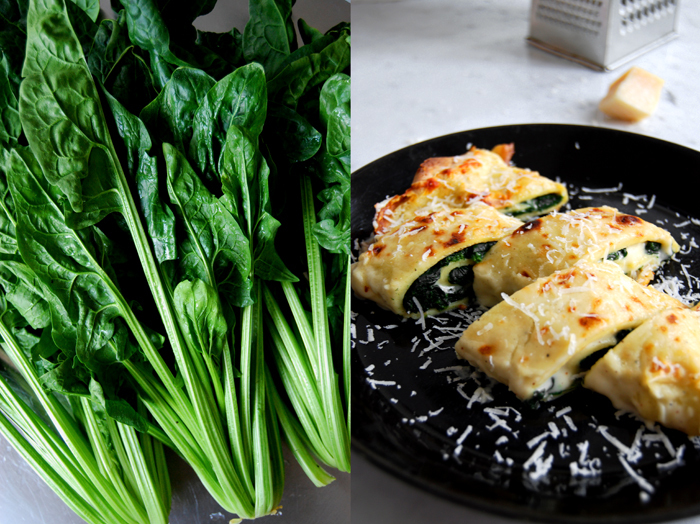 You could also replace the spinach with chard, I do that sometimes, it’s similar to my Chard and Ricotta Lasagna. Cook the spinach in salted water for 1-2 minutes (the thick leaved spinach needs 2 minutes), rinse with cold water for a couple seconds and drain. Chopped roughly, season it with salt, pepper and nutmeg and set aside. Mix the ingredients well and let the dough rest for 5 minutes. Heat some butter in a large pan and fry 4 thin crespelle one at a time, golden on both sides. 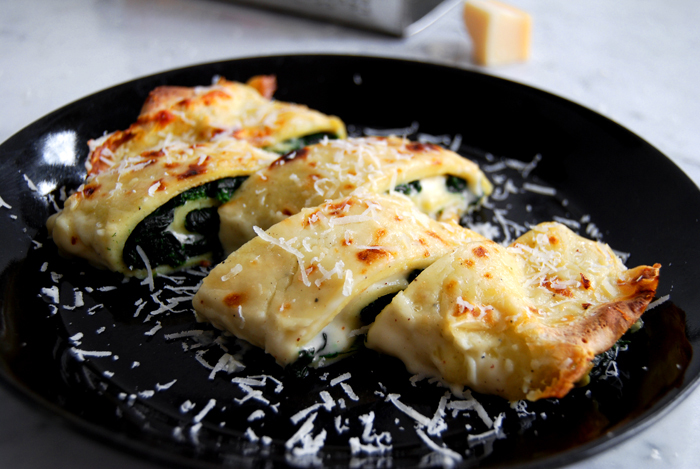 Lay a crespelle flat on a plate, spread with 1/4 of the spinach and 3 tablespoons of the Béchamel on top, roll into a wrap. Continue with the rest and put them next to each other in a baking dish. Pour the rest of the sauce on top and sprinkle with parmesan (keep some cheese for the baked crespelle, I like to put some fresh cheese on when they come out of the oven). Bake for 12 minutes or until golden brown. You can also switch on the grill for 1-2 minutes, that makes it partially crisp.